Okay, so we still don't find many stars in the CV 'period gap' with orbital periods of 2-3 hours, so in ten years since the last Wild Stars conference, and with all the new CVs discovered and measured in that time, this is a real phenomena. 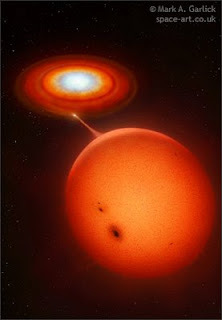 We find a lot of stars piling up around three hours period and many of these are accreting at very high rates. The secondaries are losing prodigious amounts of mass to their cannibalistic white dwarf companions. The leading theory explains this gap as the point where magnetic braking ceases and these binaries abruptly stop accreting matter from the secondary to the white dwarf. As these binaries continue to lose orbital energy through gravitational wave propagation they evolve through the period gap from 3 hours to two hours. At this point they've spiraled in close enough for the secondary to fill its Roche lobe and accretion starts up again. From orbital period (Porb) 2 hours and less the only way the system loses orbital energy is through gravity waves. Typically these stars have low accretion rates and it takes a long time for them to build up enough material in the disk to go into outburst. So the secondaries are not losing mass very quickly, and we'd expect to see another spike in the population of CVs at shorter orbital periods. One problem is the fact that these systems tend to be quite faint in quiescence, so they are harder to find than their bright actively outbursting friends at the longer Porbs. With the recent results of the Sloan Digital Sky Survey (SDSS) we've uncovered more ad more of these short period low accretion rate CVs, but there is still some debate about whether we have actually begun to pin down the actual spacial density of these objects. There aren't that many faint, short period CVs close to us, so they must indeed be rare objects. CV theories also predict a minimum Porb of about 65 minutes. There may be something wrong with our models though, because observationally, the minimum seems to be closer to 80 minutes. Either we have a whole bunch of highly evolved, low accreting faint stars out there at 23rd magnitude (beyond the limit of SDSS) or there is something lacking in our understanding of the physics at this minimum threshold for CV period evolution. To be honest, not much of this is new, or cutting edge astrophysics anymore. A lot of these same issues were being discussed ten years ago. We may have more observations and phenomenology, but we don't seem to have made any significant progress in our understanding of these Wild Stars. That is a topic I want to interrogate Steve Howell, one of the local organizers, about tomorrow. I'll let you know what he thinks.